1) How many times have you seen a piano in a hardware store? 2) How many times have you seen someone jamming out on a random piano in a hardware store? Came across this video, where yes, many of the comments where people commenting about this being staged or not. But regardless, we see a young male jamming out on a piano, and he is crushing it. Not only is he playing a piano, but singing along with it, he has the whole package down. I want to point out a few things: his glissando’s are out of this world. A glissando is when you drag your fingers across all of the keys. He does it several times throughout the song and every time they sound so natural and on beat. And I mainly would like to point out that he is missing his pinky finger on his left hand!! This was missed at first because I was so into his performance but, when I went back and watched I was amazed. I don’t think this guy realizes how great his playing is. 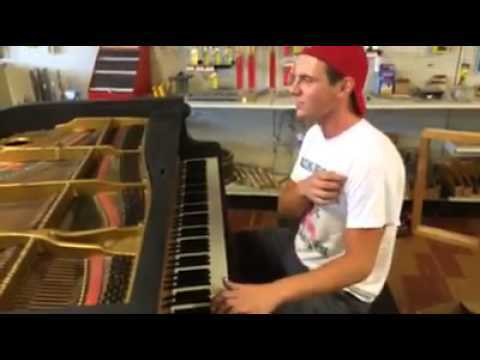 Watch this guy play the living out of this unfinished piano in a hardware store. Relive the best pop hits of the summer from 2017 - all your favorites are here in this quick mashup video. New Year's Eve with Queen!